It is inevitable, that once content becomes separate from the carrier, a transition that has already taken place, data networks will replace baseband.With the transition to digital essentially complete, we now get to reap the benefits, and havoc, that media freed of any physical carrier brings with it. This next transition is a mixed blessing. Old ways of doing things will fall by the wayside as inefficient and uneconomic. The new way of doing things is seen by many as dangerous and ill thought out. Added to these concerns is the disruption caused by start-ups taking advantage of the minimum investment required to invade the territories of vested suppliers. How can facilities with existing infrastructure make the transition with least investment and least disruption? Recent studies have shown that IP is on the radar of most facilities but is viewed as a long term transition. I would contend that the TCO of a greenfield IP installation can be justified. The reluctance to even make the comparison is indicative of the perceived risks. The paradigm shift required to go from a monolithic “Broadcast” infrastructure into an IP front end with a cloud based backend, is not going down easy. “We are not going to be building any more big iron facilities. The cloud gives us an opportunity to virtualize all of this technology so that we can very quickly spin up and down new networks and services” –Vince Roberts, EVP of Global Operations and CTO Disney/ABC Television Group. Is this guy serious? You can bet on it! The major effectors for this decision are a splintered audience and the cost of production. The term “network”, as used by Mr. Roberts, will mean something entirely different, but that is not the point. The flexibility that IP plus cloud allows, will lower the entry point for both production and contribution. The reason that the transition has been slow is the venerable routing switcher. In the last facility where I worked we had no live cameras and no vision mixer. We did however have a large routing switcher. There was some job security in this as I was the only one who could program it, but I had better things to do and was always looking for an Ethernet switch to take its place. We didn’t even do VBI switching so it should have been possible, but there was no product and I had enough DIY projects as it was. One example IP control solution is from LSB Broadcast Technology.Their VSM (Virtual Studio Manager) is an IP-based control and monitoring system that integrates the management of broadcast and production equipment into a single system. At NAB the company demonstrated a software defined network (SDN) working with equipment from Lawo, Arista, Sony and Juniper. As media companies embrace the IP technology they will face investment, operational and workflow challenges. One solution, from Imagine Communications is their Magellan SDN Orchestrator. It provides a software control system for managing hybrid baseband and IP networks. Three years later; Are we there yet? SDN (software defined networking), deterministic switching and Content Aware Routing are supposed to make it all work. 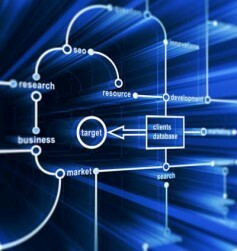 Does the commodity switch installed in the cloud include these provisions? Not yet. So we are still talking custom broadcast hardware, but now made by CISCO, Juniper, Extreme, etc. instead of Grass Valley, Snell, or SONY and other fine companies. This is where SDN can help, a standard 10G switch will work for most needs. When you need to switch VBI the SDN will make sure that this signal gets switched in the special hardware. It is not difficult to insure that an IP switch has enough overhead so that there is no packet loss and latency can be solved by buffering. One of the biggest advantages for me would have been getting rid of all the control panels in every suite and at every destination. This is where you need to do some serious thinking about deterministic switching. When all your sources are on a server somewhere and all your destinations are basically computers, who should be determining what gets switched where when? I would contend that the application should take care of this and SDN and content aware routing should insure that it is done correctly, in the background. Viewers increasing look to alternative delivery methods. 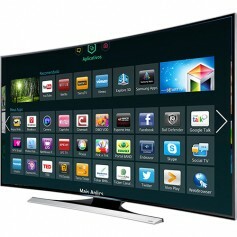 Smart TVs provide one solution. Streaming company Roku, claims to have streamed over three billion hours of programming in 2014. Roku customers streamed on average 50 hours of content a week. Adobe's Q2 2014 Digital Index reported that broadcasters and cable nets that offered programming online saw their unique monthly viewership grow by 146 percent year over year (Y/Y) across all online TV channels. I bought the Ethernet options for my VTR’s out of operating funds because this was the easiest way to gain control of the ingest. All applications required in a broadcast facility can be provisioned natively by an IP backbone. There are a myriad of interfaces for legacy equipment. Unfortunately all that copper in your SDI cables will not be enough to pay for the transition. Does a network technician cost less than a video engineer? There are a lot more of them out there. This is not to say that our unique knowledge of the intricacies of video and audio signal processing will be worthless. Network engineering is just a new talent we have to add to our toolbox and it is a lot simpler than RF antenna design! When you have done your cost analyses and determined whether to build a parallel system and do a switch over or go the same route as the transition to digital, with islands doing tectonic movements to become continents, you have three options. Many recent equipment acquisitions include the option of purchasing an internal IP interface, if your current equipment does not have such an option, and you are not ready to replace, there are many external interfaces available, but once you have made the decision any new equipment should include IP provisions. Evertz announced a strategic alliance with Sony at IBC 2014 to develop IP solutions. 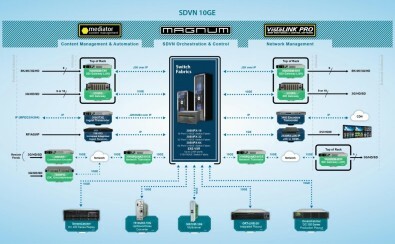 The Evertz Software Defined Video Network (SDVN) is shown here using 10Gbit connectivity. Building a parallel system is, in my opinion, the best way forward for existing facilities as it will allow for the fastest ROI, but don’t worry, there is very little actual product (June 2015). Here is one tutorial, written by Michael Johas Teener on building with IP solutions; No-excuses Audio/Video Networking: the Technology Behind AVnu. Yes you can build a complete live production system using COTS (commercial off the shelf) equipment and this may be an option for a local TV station giving up there transmitter in favour of more flexible delivery methods (see my article “Broadcasters without Spectrum”), but not for a major sporting event. Sony is pushing IP as a replacement for SDI cable infrastructure, but right now it all depends on SDI to IP interfaces as they do not currently offer native IP vision mixers or routing switchers. A Sony IBC 2014 video describing their IP solution can be found here. What I mean by native IP is that the device has 1, 10 or 100 Gbit interfaces as required and there is no intermediate decoding to SDI within the device. Some places where complete IP live production is actually happening include concert video and religious TV. Here is an excellent presentation by Hugo Gaggigoni, CTO, V.P. Technology Professional Solutions of America from last year's CCW show; IP Networking for Studio and Outside Broadcasting Production Applications. How much IP and when is going to depend on the starting point and immediate goal, but the long term result is going to be the dismantling of the so called “Broadcast Plant”. The routing switcher as a distinct product will disappear. 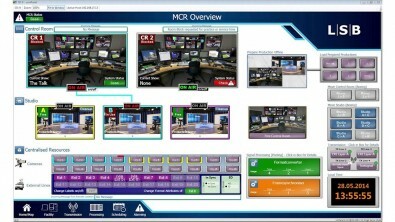 Perhaps virtual reality glasses and data gloves will replace the control room. Regardless of how it plays out the constraints of live production remain the same, however the equipment cost to make quality live production is going to continue to drop.